Submit meshes and textures you would like to be added to PC Data. Speaking of Westly, I combed through FCOT and pulled out the outfits that I think we should use. This gives us a decent amount of added variety without bloating PC_Data with a bunch of recolors of the same exact set. Mainly focused on Colovia for now, with a couple Redguard outfits for the Gold Coast. If this looks good, I'll go ahead and get these meshes renamed for the PC_C_xxx.nif format (textures will remain in Westly's original format) and packaged up with the appropriate textures, female/ground meshes, and icons. I also want to dirty up that Imperial surcoat a little bit because the gleaming white is going to look out of place in our Cyrodiil. Those are all, generally too bright and "clean" looking at the moment in my opinion. Also, do we need to get express permission to use this or did he ever come out and say FCOT could be used as a resource? credits are acknowledged and that I am notified so as to assist you if necessary:D.
not conflict with the original textures/meshes. We're going to be changing the filenames and we can certainly throw some credits into our readme. I disagree with any of them looking too clean aside from the Imperial armor, they look to me exactly like the textures we've developed ourselves. I'm definitely going to grunge up the armor but the others don't need it at all. I very much agree with this plan. I'm only not sure on the chainmal armor. I think we had such armor pieces in our data files already (as city guard armors) but decided to scrap them in favour of a more faithful design. When you are done, can you send me the files, so I may test and improve body part segmentation? I was going to create a claim for westlys clothing anyway, but you beat me to it. @SamirA: I would always look at vanilla clothing for reference. Many pieces are much lighter and more saturated than you may remember. I even like that we are having a lighter color scheme in many places, because it creates an interesting overall environmental brightness that makes Cyrodiil look like a much sunnier place than MW or Skyrim. If it is good with Worsas, then it is good with me. I respect your eye for fitting things into this game world. SamirA wrote: If it is good with Worsas, then it is good with me. I respect your eye for fitting things into this game world. For me even the cleaner looking ones are fine, because we have a different environment here. If someone would come with these at SHOTN, I would tell him the same thing you told Saint_Jiub. Now looking at the range again, the only one apart from the armor stinging out to me is the coat at the very upper right. It remembers me of some industrialization-age-movie-vampire-hunter outfit. Yeah, that one looks a bit steam punk. 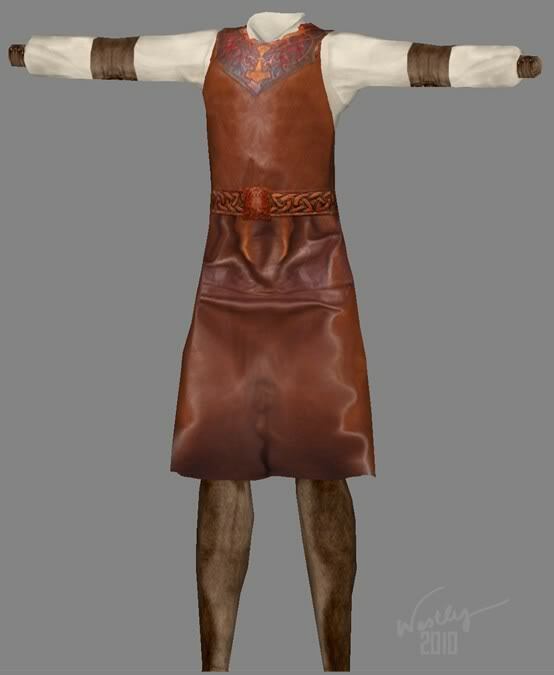 Dirtied up the Imperial surcoat as discussed, renamed all meshes/textures/icons to our naming format per the author's request in the readme, and adjusted all texture paths to point to the new textures. Also included the Nordic blacksmith's apron (link), which we hadn't discussed but which I think is going to come in handy as we get further north. This is very good news. I'll look what needs to be done still and add them to the upcoming data-version. I'm uncertain if I will be able to include the blacksmith garments easily as they are setup in a very specific way and they would intersect with all kind of armor or other clothing the way they are now no matter if used with or without bb, it is more of an incompatibility with other garment or armor than bb vs non-bb. Things like these smith garments are apparently meant to only work in a particular constellation. The same is true for that white legion armor you included. I would have to divide it into its body parts first so it can be put into use as armor. Using it as a robe seems like a hack of some sort. The non-smith shirts and skirts are fine the way they are. The pants will need segmenting still, but that is something I'm totally prepared to take care of. Incompatibility between clothing or various armor parts are a big issue in our data files. I noticed that the broader shirts I made do not do that well in combination with most armors or broader skirts. Other armor pieces we have, boots in particular, are tendencially either too short or too long and leave gaps between the body parts or intersect. I would like to resolve as much as possible of that rather than introduce new incompatibilities right now. Therefore I hope you don't mind if I'll be a bit choosy about these. I'll try to salvage as much as possible though. That is the problem with most BB resources, they use weird body parts. I'm glad we have new guard armor rather than using the BB ones we had. BB is best for simple clothing. As you forgot to include the textures for the pants, I took the chance to switch some of them around. I took some of the more colorful variants in place of others to have them as expensive alternatives. It is only two pants that differ from your selection (I could figure out by looking at the icons and the above overview).